Before I resume my reading of Grégoire Chamayou‘s Théorie du drone, I want to approach his thesis from a different direction. As I’ve noted, much of his argument turns on the reduction of later modern war to ‘man-hunting’: the profoundly asymmetric pursuit of individuals by activating the hunter-killer capacities of the Predator or the Reaper in a new form of networked (para)military violence. 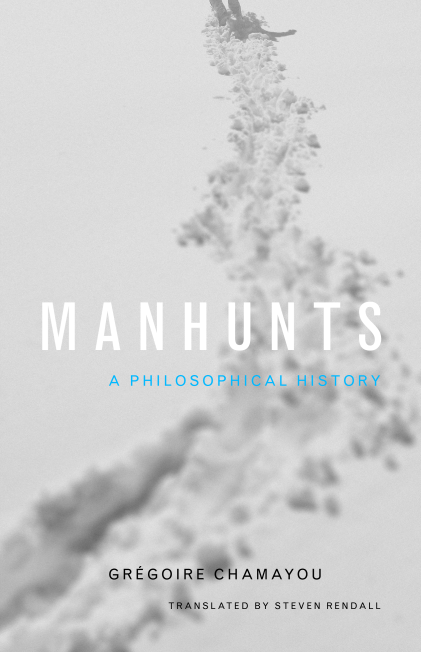 He describes this as a ‘state doctrine of non-conventional violence’ that combines elements of military and police operations without fully corresponding to either: ‘hybrid operations, monstrous offspring [enfants terribles] of the police and the military, of war and peace’. Pugliese insists that drones materialise what he calls a ‘prosthetics of law’, and the work of jurists and other legal scholars provides a revealing window into the constitution of later modern war and what, following Michael Smith, I want to call its geo-legal armature. To date, much of this discussion has concerned the reach of international law – the jurisdiction of international law within (Afghanistan) and beyond (Pakistan, Yemen and Somalia) formal zones of conflict – and the legal manoeuvres deployed by the United States to sanction its use of deadly force in ‘self-defence’ that violates the sovereignty of other states (which includes both international law and domestic protocols like the Authorization for the Use of Military Force and various executive orders issued after 9/11) . These matters are immensely consequential, and bear directly on what Frédéric Mégret calls ‘the deconstruction of the battlefield’. 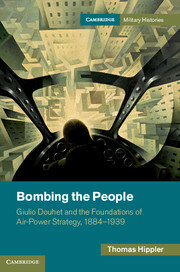 The laboratory for these experimental geographies before the Second World War was Europe’s colonial (dis)possessions – so-called ‘air control’ in North Africa, the Middle East and along the North-West Frontier – but colonial wars had long involved ground campaigns fought with little or no distinction between combatants and civilians. This should not surprise us. Law is not a deus ex machina that presides over war as impartial tribune. Law, Michel Foucault reminds us, ‘is born of real battles, victories, massacres and conquests’; law ‘is born in burning towns and ravaged fields.’ Today so-called ‘operational law’ has incorporated military lawyers into the kill-chain, moving them closer to the tip of the spear, but law also moves in the rear of military violence: in Eyal Weizman’s phrase, ‘violence legislates.’ In the case that most concerns him, that of the Israel Defense Force, military lawyers work in the grey zone between ‘the black’ (forbidden) and ‘the white’ (permitted) and actively seek to turn the grey into the white: to use military violence to extend the permissive envelope of the law. ‘…the combatant has about him something of the quality of the sacred. His acts are not entirely his own…. The exception, Kahn continues, which also marks the boundary of corporate agency, is a war crime, which is ‘not attributable to the sovereign body, but only to the individual.’ Within that boundary, however, the enemy can be killed no matter what s/he is doing (apart from surrendering). There is no legal difference between killing a general and killing his driver, between firing a missile at a battery that is locking on to your aircraft and dropping a bomb on a barracks at night. ‘The enemy is always faceless,’ Kahn explains, ‘because we do not care about his personal history any more than we care about his hopes for the future.’ Combatants are vulnerable to violence not only because they are its vectors but also because they are enrolled in the apparatus that authorizes it: they are killed not as individuals but as the corporate bearers of a contingent (because temporary) enmity. It is precisely this model that contemporary military violence now challenges through the prosthetics of law embodied and embedded in drone warfare – and this, Kahn insists, has transformed the political imaginary of warfare (You can find his full argument here: ‘‘Imagining warfare’, European journal of international law 24 (1) (2013) 199-216). 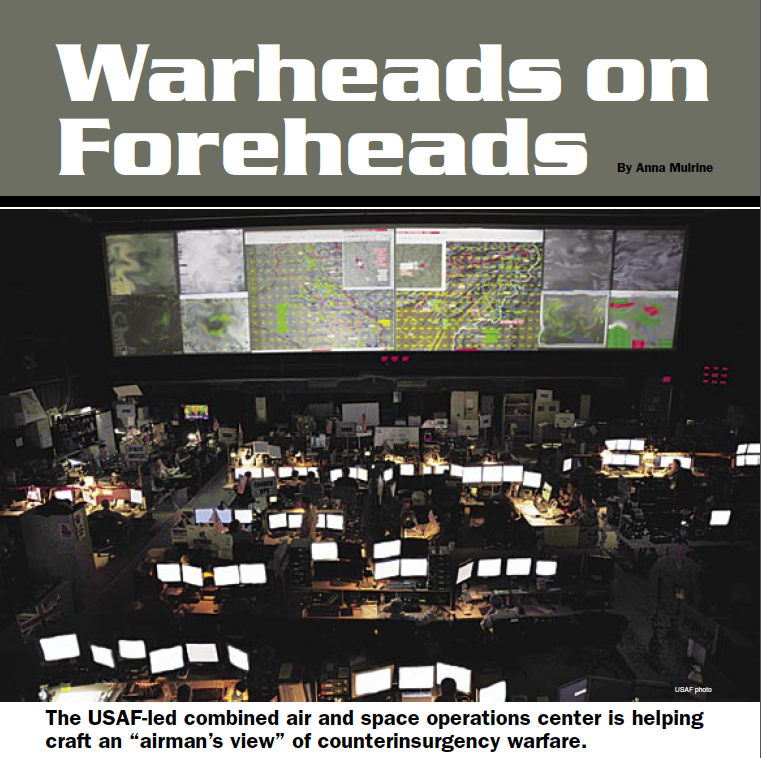 In a parallel argument, Samuel Issacharoff and Richard Pildes describe this development as the individuation of military force, driven in part by the affordances and dispositions of drone warfare which makes it possible to put ‘warheads on foreheads.’ Targets are no longer whole areas of cities – like Cologne or Hamburg in the Second World War – or extensive target boxes like those ravaged by B-52 ‘Arc Light’ strikes over the rainforest of Vietnam. The targets are individuals and, since the United States claims the right to target them wherever they are found, this partly explains the dispersed geography of what I’ve called ‘the everywhere war’. What interests Issacharoff and Pildes, like Kahn, is not so much the technology that makes this possible as the apparatus that makes it permissible. They suggest that this makes it inevitable that the boundaries between the military system and the judicial system ‘will become more permeable’ – a confirmation of the active constitution of the war/police assemblage (on which see Colleen Bell, Jan Bachmann and Caroline Holmqvist’s forthcoming collection, The New Interventionism: perspectives on war-police assemblages). ‘Political violence is no longer between states with roughly symmetrical capacities to injure each other; violence no longer occurs on a battlefield between masses of uniformed combatants; and those involved no longer seem morally innocent. The drone is both a symbol and a part of the dynamic destruction of what had been a stable imaginative structure. It captures all of these changes: the engagement occurs in a normalized time and space, the enemy is not a state, the target is not innocent, and there is no reciprocity of risk. We can call this situation ‘war’, but it is no longer clear exactly what that means. 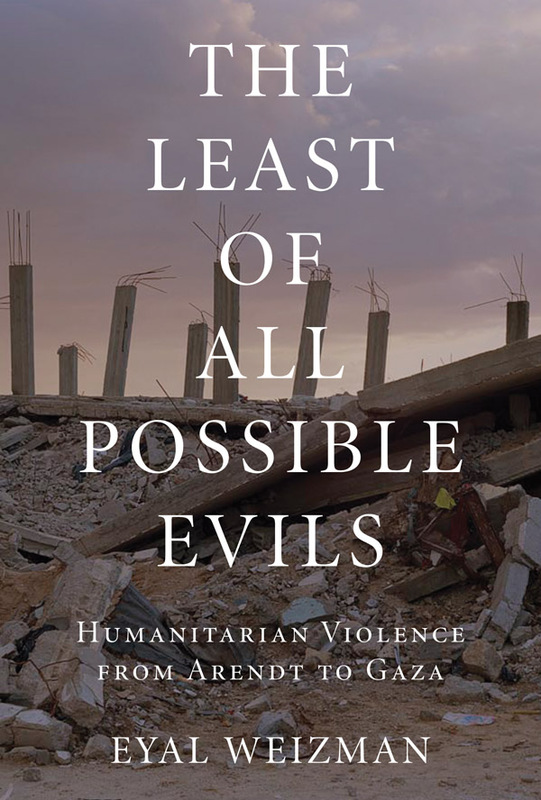 He is thoroughly alarmed at the resuscitation of what he calls ‘the history of administrative death’, whereas Issacharoff and Pildes – ironically, given what I take to be their geopolitical sympathies –treat the institution and development of an ‘adjudicative apparatus’ within the US programme of targeted killings as a vindication of their execution (sic). I want to set aside other contributions to the emerging discussion over the ‘individuation’ of warfare – like Gabriella Blum‘s depiction of an ‘individual-centred regime’ of military conduct, which pays close attention to its unstable movement between nationalism and cosmopolitanism – in order to raise some questions about the selectivity of ‘individuation’ as a techno-legal process. I intend that term to connote three things. 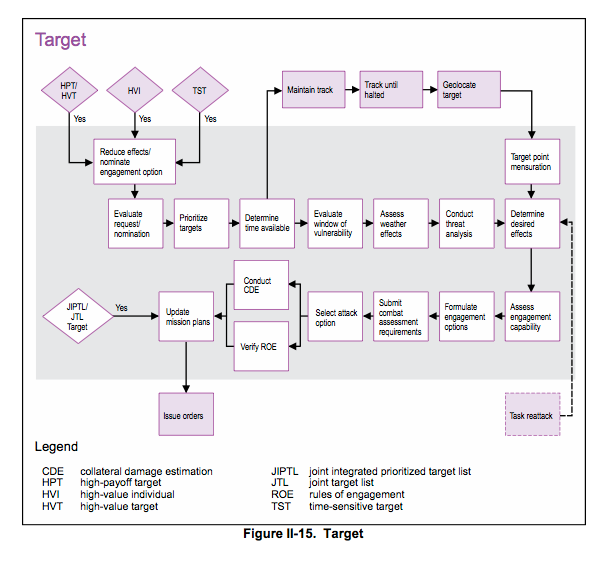 (1) First, and most obviously, Issacharoff and Pildes fasten on the technical procedures that have been developed to administer targeted killings – which include both the ‘disposition matrix’ [see here] and its derivatives and the more directly instrumental targeting cycle [the diagram above shows the ‘Target’ phase of the Find-Fix-Track-Target-Engage-Assess cycle] , both of which admit legal opinions and formularies – that convert targeted killing into what Adi Ophir calls a quasi-juridical process. This encoding works to contract the ethical horizon to the legal-juridical (see here for a critical commentary) while simultaneously diverting attention from the substantive practice – which, as I showed in ‘Lines of descent’ (DOWNLOADS tab), is shot through with all sorts of limitations that confound the abstract calculations of the targeting cycle (see, for example, Gregory McNeal here, who turns ‘accountability’ into accountancy). (2) Second, ‘individuation’ refers to the production of the individual as a technical artefact of targeting. S/he is someone who is apprehended as a screen image and a network trace; s/he may be named in the case of a ‘personality strike’ but this serves only as an identifier in a target file, and the victims of ‘signature strikes‘ are not accorded even this limited status. Others who are killed in the course of the strike almost always remain unidentified by those responsible for their deaths – ‘collateral damage’ whose anonymity confirms on them no individuality but only a collective ascription. (For more, see Thomas Gregory, ‘Potential lives, impossible deaths: Afghanistan, civilian casualties and the politics of intelligibility’, International Feminist Journal of Politics 14 (3) (2012) 327-47; and ‘Naming names’ here). Caroline Holmqvist, sharpens the same point in ‘Undoing war: war ontologies and the materiality of drone warfare’, Millennium (1 May 2013) d.o.i. 10.1177/0305829813483350); so too, and more directly relevant to the operations of a techno-legal process, does Joseph Pugliese‘s figure of drone crews as ’embodied prostheses of the law of war grafted on to their respective technologies’. If the mandated technical procedures (1 above) fail to execute a sanctioned target (2 above) and if this triggers an investigation, the typical military response is to assign responsibility to the improper performance of particular individuals (which protects the integrity of the process) and/or to technical malfunctions or inefficiencies in the network and its instruments (which prompts technical improvements). What this does not do – is deliberately designed not to do – is to probe the structure of this ‘techno-legal economy of war at a distance’ (Pugliese’s phrase) that turns, as I’ve tried to suggest, on a highly particular sense of individuation. Still less do these inquiries disclose the ways in which, to paraphrase Weizman, ‘drones legislate’ by admitting or enrolling into this techno-legal economy particular subjectivities and forcefully excluding others . Samuel Ischaroff and Richard Pildes, ‘Targeted warfare: individuating enemy responsibility’, NYU School of Law, Public Law & Legal Theory Working Papers 343 (April 2013); available here. This entry was posted in counterinsurgency, counterterrorism, drones, late modern war, law, police and tagged drones, Joseph Pugliese, Paul Kahn, Richard Pildes, Samuel Issacharoff, war/police assemblages by Derek Gregory. Bookmark the permalink. Thanks for the reply… Much food for thought. Will chase up on those helpful refs. Sorry to have taken so long to respond, Ian: the start of term was unusually busy. The general point applies to all targeting, no? Sam Weber is very good on this. So when the IDF in Gaza or the US military in Iraq claim that they “only” bombed a power station, and deliberately chose to do so at 2 a.m. when only a small night staff would be in the building in order to minimise casualties, they are being deliberately disingenuous. They know very well that with a power station out of action water can’t be pumped, sewage can’t be treated, food can’t be refrigerated, hospitals can’t operate – so that the effects of the strike ripple out from the initial point of impact in both space and time (how many people get sick or even die later?). So the target is deliberately chosen to maximise those ripple effects which surely aren’t kept on the outside (except rhetorically). I suppose you could say that, in the case of targeted killing, the ripple effects that most matter to those carrying them out involve the ‘degradation’ of the terrorist or insurgent network in which the target is supposed to be involved, but they obviously also – and not accidentally – cause immense damage to the personal and social fabric of which s/he was a part: the extended family, the local community and beyond. The question of the ‘now’ is more complicated, though, since the incorporation of an event-ontology within later modern war institutes a new temporality within the battlespace. What’s past may well be kept on the outside (though not, I think, within the span of, say, a ‘pattern of life analysis’) but the future is internalised through the logics of emergence and pre-emption. I discussed this in a preliminary way in “Seeing Red”, and Caroline Croser has all sorts of interesting things to say about it, but it needs more reflection, so thanks for the prod! I wonder about the danger of reducing the “target” to the individual for the same reason you note with respect to the way that “targets” mask the military producers and infrastructures behind their construction. This is perhaps a simple point – that a single, individual death has all kinds of “ripple effects”, all kinds of trauma that traverse an emotional landscape that never makes it to the disposition matrix. Here, I think, Butler is right to say that the “outside” of the war frame haunts the inside, even enabling it. But there might be more to it than “counting” the outside to individuated warfare. There is, I think, a de-temporalizing of the “everywhere war”, so that what is past and what is future are both kept on the “outside”. This would mean that the omnipotent “present” of the battlespace has a distinct regulatory function through a freezing, or fixing of time to the “now”. Some initial thoughts. Reblogged this on Society for Radical Geography, Spatial Theory, and Everyday Life.